GSA Archives and Collections currently has some exciting opportunities to contribute to work on our WW1 and fire recovery projects! The placements will involve researching GSA students and staff who were at the School between 1914-1918, using material from GSA’s archives such as student registers, prospectuses and annual reports from the early 20th century, as well as other resources such as publications and the internet. We’d then like you to compile short biographies for these students and staff, which will be added to our online catalogue. Please take a look at our blog for information about the research conducted so far. This is a great opportunity for those of you who’d like to gain more experience of working with original archive material and conducting archival research. Full training will be provided and you will learn how to undertake this type of research, how to use the resources available, how to handle the material properly, how to use collections management software, and how to compile biographies. There will also be opportunities to disseminate your research via presentations/talks and via our blog. Where possible we also try and plan events (such as talks or visits) and development opportunities as part of your placement. In 2014 a major fire occurred in Glasgow School of Art’s historic, Grade A-listed Mackintosh Building. This resulted in the loss of parts of the School’s built heritage, art and furniture holdings and damage to some its paper based archives and textile collections. A programme of collection management and collection development work to stabilise and rebuild these holdings is now well underway. Cataloguing, documentation and repackaging forms a major part of this project. We are looking for an enthusiastic, reliable and trustworthy individual with an interest in archive work, history, art education or the history of GSA. You will have good communication skills and excellent attention to detail. Initially working alongside the Assistant Archivist: Cataloguing, this placement will firstly involve appropriately labelling recently catalogued records from GSA’s institutional archives. Further tasks include rehousing photographs from the George and Cordelia Oliver archive in conservation grade packaging and labelling accordingly, and some indexing work on the Archives and Collections blog. This is a great opportunity for those of you who’d like to gain more experience of working with original archive material and will provide an opportunity for you to develop your understanding of archive work more broadly. Full training will be provided and you will learn how to how to handle the material properly, how to label appropriately according to strict guidelines, how to use collections management software. There will also be opportunities to disseminate your work via our blog. Where possible we also try and plan events (such as talks or visits) and development opportunities as part of your placement. Please take a look at our blog for examples of volunteer placements conducted thus far. 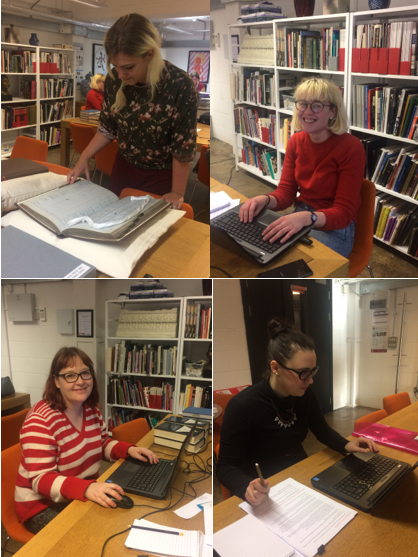 Some of our volunteers busy researching! IMPORTANT: Volunteers must be able to commit to 1 day a week for 12 weeks in the first instance, starting in May. Volunteers must be available to come in on Tuesdays. It is envisaged that an induction morning will be held on Tuesday 22nd May and that volunteers should be available to start the following week (Tuesday 29th May). If you are interested in applying please send a covering letter and CV (including contact details for two referees, and indicating your preferred placement) to Michelle Kaye, Collections Development Officer, m.kaye@gsa.ac.uk by 5pm on Monday 7th May.